Head lice are a frustrating and troublesome issue for children and whole families alike. These small wingless insects are able to multiply in very short periods of time, meaning that a single head louse picked up at school can soon turn into an infestation. Female head lice are able to lay a huge number of eggs that are then cemented in place near the root of hairs. The hatchlings are able to reach maturity in just 9 days making a fast response essential when treating these uninvited guests. The average infestation is about 20 lice. However, as many as 300 can be present in severe cases if left untreated. Around half of all 11-14 year olds will catch nits at some point during the year. Head lice can develop an immunity to many commercial shampoos and products as proven by leading government research. Head lice infection is the second most communicable health issue amongst children. Head lice only feed on human blood. Without a meal they will die within around 48 hours. They do not live on pets. You need to remove not only all the lice, but all the eggs as well to break an infestation. That's the tricky and time-consuming part for parents! 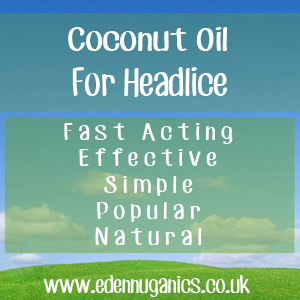 A 2009 study looking into the benefits of coconut oil in the treatment of head lice concluded that coconut-oil based spray was more effective than Permethrin or pyrethrin, one of the leading pharmaceutical options. These are fairly effective but they do not kill all the eggs. In addition, they may not kill all the nymphs and adults, especially if the population is developing resistance to the insecticide and yes... it is an insecticide so it is advisable to wash the hair over a basin to avoid getting it on other parts of the body (unlike coconut oil). When it comes to children, surely it would be better to avoid using harsh chemicals like this on their delicate skin. Other clinical trials have produced similar findings. With a success rate of around 90 per cent, coconut oil makes a fantastic alternative to conventional often toxic insecticides. The fat content of the coconut oil essentially suffocates the lice and makes it harder for them to maintain their grip on the hair. Interestingly and more recently, enzymatic treatments have been introduced which claims to rule out the need for lice combing by dissolving the egg and/or the cement that holds the egg to the hair but in university-conducted research trials none of these products have yet been proven to work as advertised. Tea tree is a powerful essential oil that acts as a natural insecticide. These two effective ingredients together results in one of the most popular home treatments for head lice. The first step is to make a mixture of 2 tablespoons of coconut oil and 3 to 5 drops of tea tree oil. Massage this into the hair, making sure to work it right down to the roots. Next, cover the treated hair securely with a shower cap or tight plastic bag, ideally for 12 hours or overnight. After this time has passed, remove the bag and apply 6 ounces of shampoo directly to the hair without wetting it first. Using the same bag recover the hair for a further 30 minutes, allowing time for the oil to do its work. It's now time to rinse your hair as thoroughly as possible. Comb through the hair to remove tangles. At this stage a head lice comb can be used to easily remove both lice and nits from the scalp. Remember to rinse the comb and wipe it with a clean tissue after completing each section. Apple Cider Vinegar - The acids found in raw apple cider vinegar are able to effectively detach nit eggs from the hair roots. This is a vital step in breaking the 9 day life cycle of head lice. When purchasing ACV for this use, remember to look out for the raw, unfiltered varieties as they contain far more beneficial enzymes and acids.